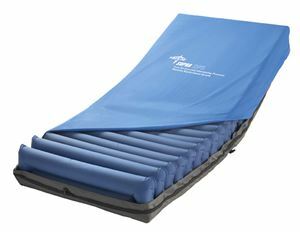 Low Air Supra DPS Mattress by Medline Canada is the feature-driven mattress replacement system. Made up of Aircell material, it can hold 400lbs. Features a quick connector that makes the setup easy and keeps the mattress bloated even during the transport. Alarms with both audio and visual indicators. Available with 4" elevated air bolsters that helps the patients from fallng.